Why Choose Displacer Level Transmitters Over Differential Pressure Level Transmitters? Many technologies have been available over the years have helped the process control industry with level measurement. From basic mechanical float-operated level switches, the process automation industry has been developing new technologies to make industry safer and more efficient. An example of a "tried and true" technology that was commonly used in the process automation industry is the DP (differential pressure) level transmitter. First introduced in the 1950s, DP transmitters measures the hydrostatic (head) pressure of a liquid in a tank or vessel and interprets this as level, based on the density/specific gravity of the liquid and programmed in by the user. A newer, alternative technology to DP transmitters is the displacer level transmitter, a device also based on specific gravity. While they both are dependent on specific gravity, they are significantly different in areas of installation, accuracy, and maintenance requirement. Infers Level vs. Direct Contact - DP transmitters use inferential measurement to determine level measurement from the hydrostatic pressure. Despite requiring the specific gravity variable having to be programmed into the transmitter electronics, the level displacer transmitter is in contact with the process media and the level measurement is direct. Time Required to Set up / Calibrate: DP transmitters requires time consuming and expensive calibration/re-calibration if any of the set-up parameters change or if the same DP transmitter is used on different materials in the same tank. Displacer transmitters only require two variables to be programmed (temperature and specific gravity), making it easier when running multiple products in the same tank. Furthermore, many displacer transmitters do not require liquid to be present for calibration. They are programmed (wet or dry) using software. A huge time and money saving over DP transmitters. Orientation and Tank Penetration - The physical mounting of DP transmitters is limited, which can in some situations can become downright problematic. 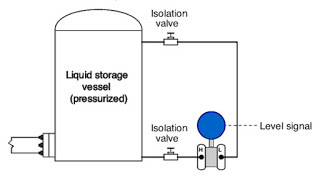 DP transmitters require (2) side-mounted entry locations on the vessel or tank, with one having to be near the bottom. As a general rule, the fewer the entry points of a tank or vessel, the better (because of leakage). Tank bottom entries are all the more so concerning. Displacer transmitters are mounted to meet the requirements of the application and do not require a connection at the bottom of the tank. Consider Overall Installed Cost - While DP transmitters have a lower unit cost, adding ancillary components such as tubing and heat tracing can quickly "level" the installation cost playing field. Furthermore, don't discount the time cost savings when setting up, calibrating and re-calibrating displacer transmitters. DP transmitters have a normal operating temperature of up to 250°F, with an upper limit of 650°F when special options are specified. Displacer transmitter can be used up to 850°F, very helpful particularly with level measurement in a hot oil separator application. There are many options and variants to accommodate industrial level applications. Share your level application challenges with instrumentation specialists, leveraging your own knowledge and experience with their product application expertise to develop the most effective solution.